Toulmouche was probably the first physician to report a case of malignant external otitis (MEO), in 1838. In 1959, Meltzer reported a case of pseudomonal osteomyelitis of the temporal bone. In 1968, Chandler discussed the clinical characteristics of malignant external otitis (MEO) and defined it as a distinct clinical disease. He described this external otitis as malignant because he observed an aggressive clinical behavior, poor treatment outcome, and a high mortality rate for the patients affected by this disease. The subsequent development of effective antibiotics for treating pseudomonal infections has improved the treatment outcomes for patients with malignant external otitis (MEO). Thus, some physicians have suggested that the term malignant should be abandoned in order to provide a more accurate description of the disease process. The leukocyte count in malignant external otitis (MEO) is usually normal or mildly elevated. A left shift is not commonly found. The erythrocyte sedimentation rate (ESR) is invariably elevated, with an average of 87 mm/h. Patients with known diabetes need an evaluation of the serum chemistry to determine if the infection is affecting their baseline glucose intolerance. Patients without a history of diabetes should be tested for glucose intolerance. 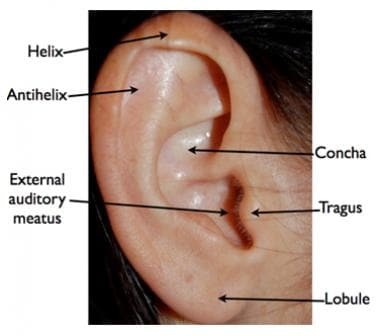 Culture from the ear drainage should be performed ideally before antimicrobial therapy is initiated. As mentioned, the most common causative organism is P aeruginosa (95%). Imaging studies are important for determining the presence of osteomyelitis, the extent of disease, and response to therapy. They include technetium Tc 99 methylene diphosphonate bone scanning, gallium citrate Ga 67 scanning, indium In 111–labeled leukocyte scanning, computed tomography (CT) scanning, and magnetic resonance imaging (MRI). Obtain a biopsy of the external auditory canal to exclude carcinoma or other etiologies. Treatment for malignant external otitis (MEO) includes meticulous glucose control, aural toilet, systemic and ototopic antimicrobial therapy, and hyperbaric oxygen therapy. [3, 4] Surgery is now reserved for local debridement, removal of bony sequestrum, and abscess drainage. Malignant external otitis (MEO) is more common in humid and warm climates than in other climates. Cranial nerves can be affected by inflammation along the skull base or by a neurotoxin produced by Pseudomonas species. The facial nerve (VII) is affected most commonly, usually at the stylomastoid foramen. As the disease progresses, cranial nerves IX, X, and XI can be affected at the jugular foramen, followed by XII at the hypoglossal canal. Cranial nerves V and VI can be affected if the disease extends to the petrous apex. In 1977, Chandler reported a 32% incidence of facial nerve paralysis. The incidence of facial nerve paralysis appears to have decreased with the development of more effective medical therapy as shown by Franco-Vidal et al who reported a 20% incidence of facial nerve paralysis in 46 treated patients. The other cranial nerves are affected less frequently than the seventh cranial nerve. The development of cranial neuropathy generally was thought to reflect advanced-stage disease associated with a worse prognosis. More recently, Corey et al, Soudry et al, and Mani et al suggested that the presence of facial nerve paralysis does not worsen the prognosis. [7, 8] Recovery of facial nerve function is poor and unpredictable, and should not be used as an indicator of successful treatment. Other cranial nerves that are affected have a higher rate of recovery. These complications rarely occur in the absence of cranial nerve palsies. Meningitis, brain abscess, and dural sinus thrombosis may ensue. Cranial neuropathies related to the jugular foramen should raise concern for sigmoid sinus thrombosis. Cavernous sinus thrombosis should be considered if cranial nerves V or VI are affected. Intracranial complications reflect severe disease and are commonly fatal. Malignant external otitis (MEO) is more common in males than in females. Malignant external otitis (MEO) has been reported in all age groups but is most common in patients who are elderly (age, >60 y). Karaman E, Yilmaz M, Ibrahimov M, Haciyev Y, Enver O. Malignant otitis externa. J Craniofac Surg. 2012 Nov. 23(6):1748-51. [Medline]. Chandler JR. Malignant external otitis. Laryngoscope. 1968 Aug. 78(8):1257-94. [Medline]. Ling SS, Sader C. Fungal malignant otitis externa treated with hyperbaric oxygen. Int J Infect Dis. 2008 Sep. 12(5):550-2. [Medline]. Phillips JS, Jones SE. Hyperbaric oxygen as an adjuvant treatment for malignant otitis externa. Cochrane Database Syst Rev. 2013 May 31. 5:CD004617. [Medline]. Chandler JR. Malignant external otitis: further considerations. Ann Otol Rhinol Laryngol. 1977 Jul-Aug. 86(4 Pt 1):417-28. [Medline]. Franco-Vidal V, Blanchet H, Bebear C, Dutronc H, Darrouzet V. Necrotizing external otitis: a report of 46 cases. Otol Neurotol. 2007 Sep. 28(6):771-3. [Medline]. Soudry E, Joshua BZ, Sulkes J, Nageris BI. Characteristics and prognosis of malignant external otitis with facial paralysis. Arch Otolaryngol Head Neck Surg. 2007 Oct. 133(10):1002-4. [Medline]. Mani N, Sudhoff H, Rajagopal S, Moffat D, Axon PR. Cranial nerve involvement in malignant external otitis: implications for clinical outcome. Laryngoscope. 2007 May. 117(5):907-10. [Medline]. Nawas MT, Daruwalla VJ, Spirer D, Micco AG, Nemeth AJ. Complicated necrotizing otitis externa. Am J Otolaryngol. 2013 Nov-Dec. 34(6):706-9. [Medline]. Sylvester MJ, Sanghvi S, Patel VM, Eloy JA, Ying YM. Malignant otitis externa hospitalizations: Analysis of patient characteristics. Laryngoscope. 2017 Oct. 127 (10):2328-36. [Medline]. Hobson CE, Moy JD, Byers KE, et al. Malignant otitis externa: evolving pathogens and implications for diagnosis and treatment. Otolaryngol Head Neck Surg. 2014 Mar 26. [Medline]. Gruber M, Roitman A, Doweck I, et al. Clinical utility of a polymerase chain reaction assay in culture-negative necrotizing otitis externa. Otol Neurotol. 2015 Apr. 36 (4):733-6. [Medline]. Goh JPN, Karandikar A, Loke SC, Tan TY. Skull base osteomyelitis secondary to malignant otitis externa mimicking advanced nasopharyngeal cancer: MR imaging features at initial presentation. Am J Otolaryngol. 2017 Jul - Aug. 38 (4):466-71. [Medline]. Peleg U, Perez R, Raveh D, Berelowitz D, Cohen D. Stratification for malignant external otitis. Otolaryngol Head Neck Surg. 2007 Aug. 137(2):301-5. [Medline]. Lee JE, Song JJ, Oh SH, Chang SO, Kim CH, Lee JH. Prognostic Value of Extension Patterns on Follow-up Magnetic Resonance Imaging in Patients With Necrotizing Otitis Externa. Arch Otolaryngol Head Neck Surg. 2011 Jul. 137(7):688-93. [Medline]. Levenson MJ, Parisier SC, Dolitsky J, Bindra G. Ciprofloxacin: drug of choice in the treatment of malignant external otitis (MEO). Laryngoscope. 1991 Aug. 101(8):821-4. [Medline]. Benecke JE Jr. Management of osteomyelitis of the skull base. Laryngoscope. 1989 Dec. 99(12):1220-3. [Medline]. Davis JC, Gates GA, Lerner C, Davis MG Jr, Mader JT, Dinesman A. Adjuvant hyperbaric oxygen in malignant external otitis. Arch Otolaryngol Head Neck Surg. 1992 Jan. 118(1):89-93. [Medline]. Berenholz L, Katzenell U, Harell M. Evolving resistant pseudomonas to ciprofloxacin in malignant otitis externa. Laryngoscope. 2002 Sep. 112(9):1619-22. [Medline]. Carlton DA, Perez EE, Smouha EE. Malignant external otitis: The shifting treatment paradigm. Am J Otolaryngol. 2018 Jan - Feb. 39 (1):41-5. [Medline]. Lee SK, Lee SA, Seon SW, et al. Analysis of Prognostic Factors in Malignant External Otitis. Clin Exp Otorhinolaryngol. 2017 Sep. 10 (3):228-35. [Medline]. [Full Text]. Stevens SM, Lambert PR, Baker AB, Meyer TA. Malignant Otitis Externa: A Novel Stratification Protocol for Predicting Treatment Outcomes. Otol Neurotol. 2015 Sep. 36 (9):1492-8. [Medline]. Mion M, Bovo R, Marchese-Ragona R, Martini A. Outcome predictors of treatment effectiveness for fungal malignant external otitis: a systematic review. Acta Otorhinolaryngol Ital. 2015 Oct. 35 (5):307-13. [Medline]. [Full Text]. Foden N, Burgess C, Damato S, et al. Concurrent necrotising otitis externa and adenocarcinoma of the temporal bone: a diagnostic challenge. BMJ Case Rep. 2013 Nov 6. 2013:[Medline]. Chin RY, Nguyen TB. Synchronous malignant otitis externa and squamous cell carcinoma of the external auditory canal. Case Rep Otolaryngol. 2013. 2013:837169. [Medline]. [Full Text].